Caffeine, alcohol and cigarettes are wildly popular and definitely part of our modern urban culture. Unfortunately they also harm fertility and decrease conception rates. If you enjoy several coffees per day and a few drinks in the evening after (or during) work it is a good idea to cut back on these habits as much as you can. You will be doing your sperm a big favor! There is a lot of clinical research showing that stress creates a vicious cycle of messed up hormones that sabotage male fertility on different levels. 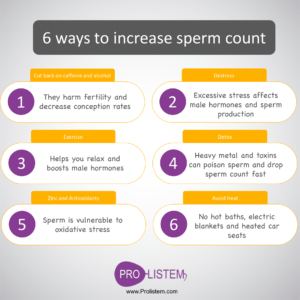 Starting from important hormone centers in the brain (hypothalamus and the pituitary gland), excessive stress eventually affects testicular cells, which oversee the sperm production process. The net result is a decrease in testosterone levels, which in turn affects sperm production. This hormone imbalance leaves sperm and sensitive testicular cells exposed to free radicals and oxidative stress. Free radicals essentially destroy whatever they touch in our bodies, so having sufficient defenses against them is the baseline for long-term health. Any stress-relieving modality that can fit in your schedule is welcome here. From meditation, exercise (see below), mindfulness or plain relaxation methods, destressing should be a major part of any regime aiming to boost male fertility. Our bodies are designed to move and indeed regular exercise can boost fertility in both sexes. On the contrary, inactivity and sedentary lifestyle are related to a whole group of bad situations, such as diabetes and obesity, which are more than certain to reduce fertility. Moderate intensity training helps you relax and normalizes male hormones, which in turn help the body produce better quality sperm. Exercise also helps with the blood sugar metabolism, which is critical for optimal sperm production. You don’t need to be an Olympic athlete to have babies; just make sure you work out your heart and muscles on a regular basis (that is 3-4 times per week). On the other hand, excessive and very intensive exercise increases oxidative stress in the body and inevitably, in the reproductive system as well. 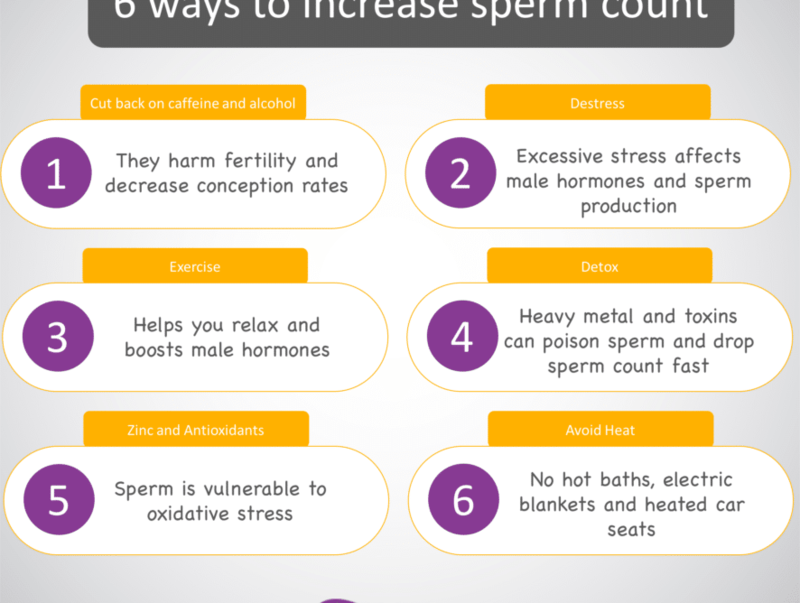 Heavy metals and toxins can poison sperm and drop sperm count very fast. Such toxins can come from food (i.e. sushi made of large fishes laced with lead and endocrine disrupting chemicals), the air (if you work or live in a sealed, exclusively air-conditioned building) or even water (contaminated water with arsenic, pesticides etc). Recent heavy metal exposure can be easily be tested with a hair sample. Apart from trying to eliminate the possible sources of toxicity in your life (i.e. stop eating large fishes and check your water for toxic culprits), a good detoxification program will help your body get rid of the toxic burden. Chlorella and spirulina have been shown to have excellent detox properties – just make sure you get organic, certified products. In addition, cabbage and vegetables of the same family (broccoli, Brussels sprouts, cauliflower) contain powerful natural substances which help the body get rid of a large variety of toxins and poisons. Include them in your diet as much as you can. As mentioned before, testicular cells and sperm are vulnerable to oxidative stress caused by free radicals. If you are living in a big city, have a stressful daily life and/or you need additional antioxidants. 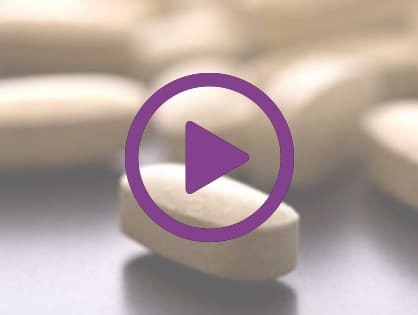 This is why many male fertility-boosting supplements are essentially based on providing large doses of strong antioxidants. Zinc and selenium are minerals with major antioxidant capacity. Also, vitamin C and vitamin E are well known for battling oxidative stress on a cellular level. 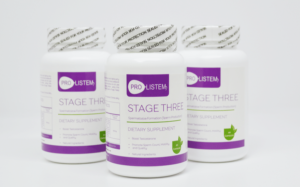 A good quality supplement should provide adequate quantities of all these essential nutrients. Going beyond the basics, a super antioxidant every man should be aware of is astaxanthin. This is a carotenoid (substance giving orange-pink color) isolated from marine phytoplankton (tiny seaweeds), which has 550 times the antioxidant strength of Vitamin E and 6000 times that of Vitamin C! The incredible antioxidant power of astaxanthin has been confirmed by several scientific studies, especially against inflammatory conditions. There is a reason why testicles hang lower than the abdomen; the sperm is sensitive to heat and even body temperature can sabotage its efficient production. So, you need to avoid things that raise scrotal temperature. As long as you are trying to have a baby, stop taking hot baths, using electric blankets and remove heated car seats. Also, tight-fitting underwear is clearly associated with lower sperm counts and motility. Opting for loose-fitting underwear and pants is a conservative but effective way to lower scrotal temperature and boost sperm production.